The dawning of a new year marks a somewhat unofficial beginning of another busy Alaska tourist season, even if most of the hubub is found on the internet. 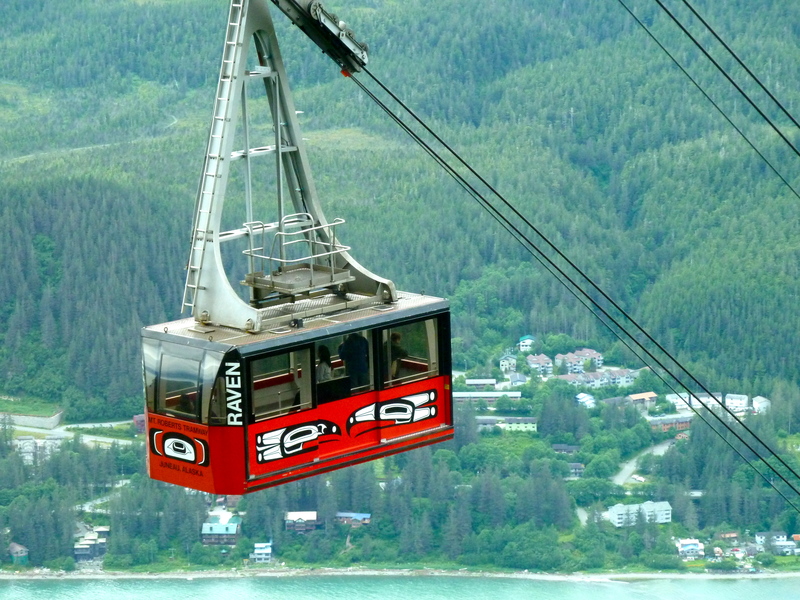 January 1’s arrival means many travel industry vendors, parks, and services begin accepting reservations for the coming summer of Alaska adventure. If you’re one of the nearly 2 million people expected to journey to the Last Frontier in 2015, pay attention. 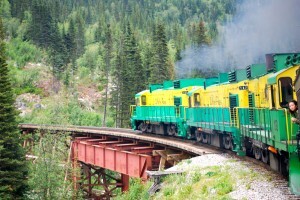 For those who have visited Alaska before, you already know how crowded the state’s most popular destinations can be during the summer months, a somewhat surprising discovery given the vastness of Alaska. Savvy tourists know that early planning is key, particularly between the months of May and September, so even though you still may be staring at the remnants of your Christmas tree and leftover holiday treats, today would be a great day to organize your Alaska vacation, if only for a few minutes. 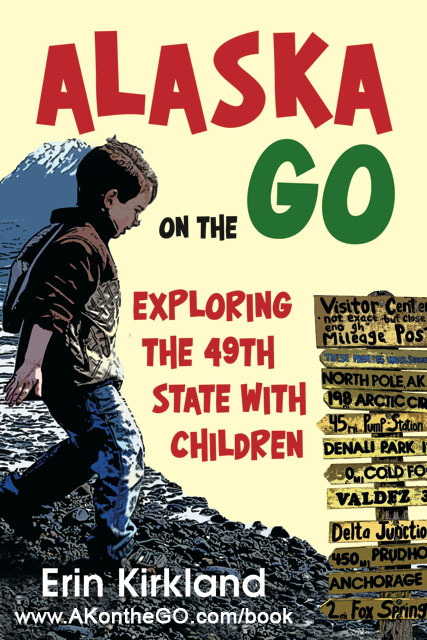 Below is the first in a three-part series to kick off 2015, particularly for families visiting Alaska with children. Some are new, some old standbys, but all possess a unique aspect of the 49th state that drives home the reason you want to visit in the first place. 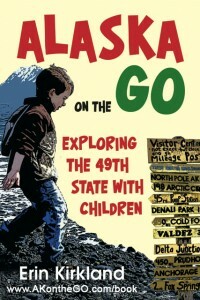 I’ve broken down the state by geographical section, similar to the way it appears in my book, Alaska On the Go: Exploring the 49th state with children. Let’s explore…Southeast Alaska. Also known as the “panhandle” section of the state, Southeast is the most heavily-visited area, thanks to a vibrant cruise industry that brings more than a million people up the famed Inside Passage to cities like Ketchikan, Juneau, Skagway, and Sitka. If you’re planning a trip and want to see lush forests, lots of marine life, and a thriving Alaska Native culture, look no further, and plan to take to the water, but maybe not the way you envisioned. Wilderness Adventurer (WAV), ready for a day of exploring with Un-Cruise! 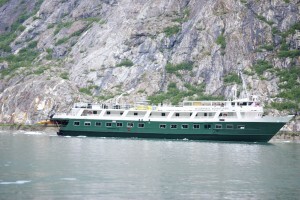 Small ship cruising is becoming a very popular means by which to travel the Inside Passage. Holding up to 80 passengers (as opposed to 800 or more), small ships can snuggle into coves and small towns with ease, allowing for authentic Alaska experiences in a laid-back, no-frills fashion that appeals to many families. Hiking, kayaking, wildlife-watching, and more are included in the price, making this style of cruising worth every penny. Try Un-Cruise Adventures or Alaskan Dream Cruises for a week or two of sailing the briny seas of Southeast Alaska. 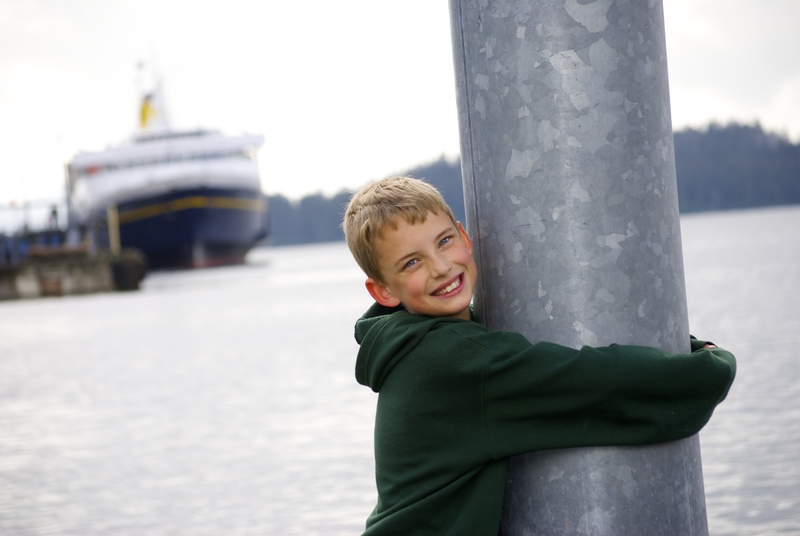 The Alaska Marine Highway System ferries are family-friendly to the max. Cruising not your thing? Our favorite way to see Alaska thus far has been aboard the Alaska Marine Highway System, or ‘blue canoe’ ferries. 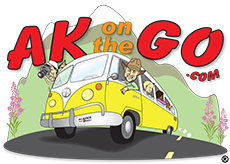 In fact, we like theferries so much my second book, Alaska On the Go: Exploring the Marine Highway System with children, is bound to be a fun read when released in 2016. Beginning in Bellingham, WA, and sailing the Inside Passage among various routes and timetables, AMHS is a wonderful, low-key way to see Southeast. Whether spending one day or one week on board a ferry, kids and parents will enjoy the independence of exploring the smaller communities and larger cities at your own pace. We like the Juneau-Skagway-Sitka-Petersburg-Wrangell-Ketchikan run for kids; from museums to hikes and to amazing wildlife experiences, there is no shortage of family fun. 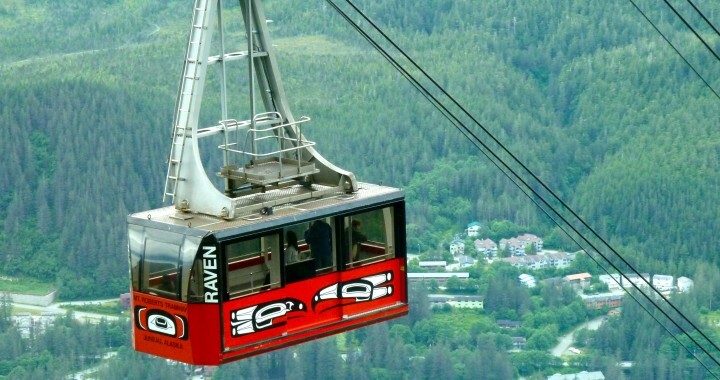 Mount Roberts Tramway: A bright red gondola whisks your family 1,800 feet to the top of Mount Roberts, where hikes, a restaurant, bird sanctuary, and stunning views await. Best time to visit? When no cruise ships are in town, or later in the evening, when ships have left and sunsets can be lovely. 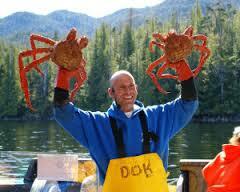 Bering Sea Crab Fishermen’s Tour: Remember ‘Deadliest Catch’? Now your kids can see up-close the lifestyle of a crab fisherman, minus the 50-foot seas and dangerous conditions. Hint? Book early via their website, and avoid the hassle of lines on tour day. Sockeye Cycle Co: Take a spin around this rejuvinated Gold Rush town on a bike, stopping by Soapy Smith’s gravesite, the Klondike Gold Rush National Historical Landmark buildings, and local trails toward the Native community of Dyea. Tag-a-longs available for smaller riders, and helmets provided. White Pass Yukon Route RR: No one should leave Skagway without a ride on the WPYR; a narrow-gauge train that winds up, up, and up some more, following the remnants of the Chilkoot Trail of gold-seeking history. Hint? The three-hour tour is usually plenty for kids. Sitka Sound Science Center: Undergoing a beautiful transformation for marine science, the center is located right along the waterfront and features drop-in classes, a touch tank, and enormous aquarium of fish. Small but charming. 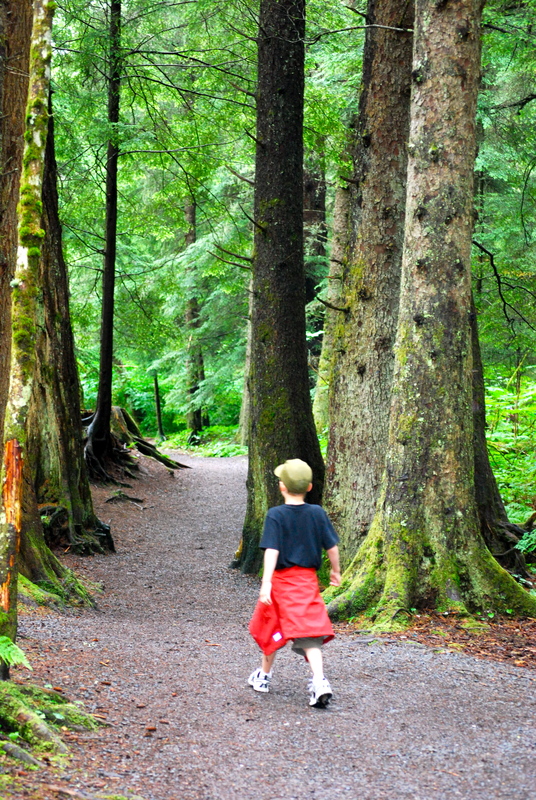 Sitka National Historical Park: Hike beneath a canopy of enormous spruce and hemlock trees, view ancient totem poles scattered along the trails, and breathe in the history and culture of this sacred place. Don’t forget to grab a Junior Ranger activity book, either! 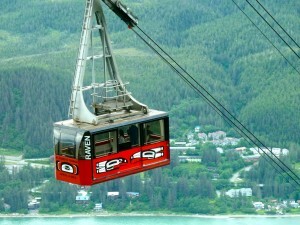 Posted in Southeast Alaska and tagged Alaska with Kids, Family Travel, Juneau, Ketchikan, Sitka, Skagway, Southeast Alaska. ← Happy New Year! Kids, how about creating a tree full of wishes?